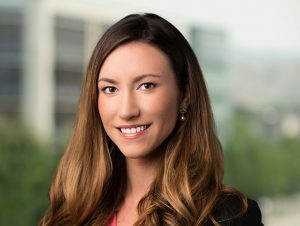 Elam & Burke is pleased to welcome Ms. Gans as she rejoins the firm after serving a sixteen-month clerkship for the Honorable B. Lynn Winmill, Chief Judge of the United States District Court for the District of Idaho. Her practice focuses on employment and commercial litigation, but she advises clients in a variety of civil matters. Prior to joining the firm, Ms. Gans also clerked for the Honorable Jim Jones of the Idaho Supreme Court. While in law school at the University of Idaho, Ms. Gans was a member of the Idaho Law Review, where she received the Outstanding Associate Writer award in 2012. At California State University, Fullerton, Ms. Gans was a 4-year member of the Division I women’s soccer team. Ms. Gans was raised in Idaho. She enjoys traveling, running, and spending time with her family.